Fiji’s Ambassador to Japan HE Isikeli Mataitoga visited the Navuso Agricultural Technical Institute on Friday 27th January, 2017, and boosted the morale of the students after handing over a donation of $10,000. The donated funds was raised by his mission in Tokyo spearheaded by Madame Venina Mataitoga. HE Mataitoga informed that his Mission is looking at other ways to assist the Institute. He also mentioned that he is in discussions with the relevant government agencies in Japan to bring volunteers to the Institute to assist the teaching staff especially in imparting the technical know-how that Japan is renowned for. Ambassador Mataitoga challenged the 50 students who would be Fiji’s future farmers to believe in themselves. He emphasized on the need to trust in God in everything as well as the importance of helping others. Ambassador Mataitoga said that was the first of the much assistance they would be doing for the institute. HE Mataitoga handing over the cheque to Navuso Agricultural Institute officials. Former principal Reverend Malakai Tuikadavu thanked Ambassador Mataitoga and his mission for the much needed assistance. 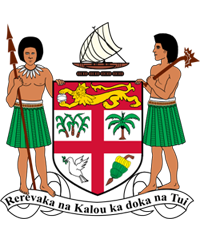 He said the Institute which belong to the Methodist Church of Fiji cater for students from all over Fiji. Navuso’s core objective is to train farmers and the Institute offers courses which will help those students achieve that. Governor Yoshinori Yamaguchi, led his Saga Prefectural Delegation that paid a courtesy call on Prime Minister Bainimarama, on 24th January, 2017. The delegation was accompanied by Fiji’s Ambassador to Japan, HE Mataitoga and Permanent Secretary for Foreign Aaffairs, Ambassador Nair. L-R : HE Mataitoga, PS Nair, PM Bainimarama, Governor Yamaguchi, Mr Hideshima (Saga City Mayor), Mr Fukui (Saga City Assembly) and Mr Koga (Saga Rugby Union). The discussions between PM Bainimarama and his Saga guests were centred on boosting development cooperation exchanges in the areas of culture, sports and arts. 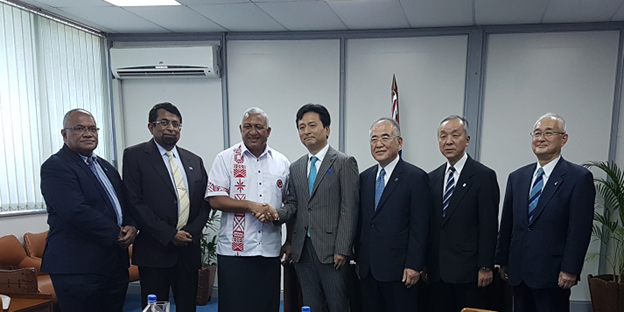 PM Bainimarama also gave his support towards strengthening relations between Fiji and Saga Prefecture. 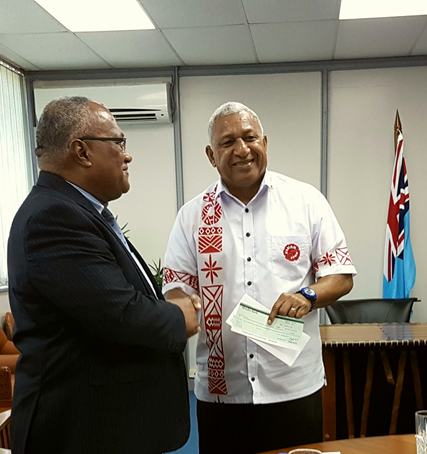 Ambassador Mataitoga presented the Fiji Embassy’s (FET) Cyclone Winston Appeal Funds to Prime Minister Bainimarama on 23th January 2017. In handing over the F$250,000 cheque, HE Mataitoga informed the Prime Minister that the funds comes with the prayers and warm wishes of Fiji’s friends in Japan towards Fiji’s recovery and rehabilitation efforts, especially for students and youths. The PM was informed that the Embassy coordinated Winston Appeal efforts saw donations from Japanese Prefectural and City Governments, businesses, academia, NGOs, Fijian community, individuals, Japanese students, and people from all walks of life. Japan’s Parliamentary Vice Minister for Foreign Affairs, Hon. Mr Motome Takizawa during a bilateral meeting with Fiji’s Minister for Employment, Productivity and Industrial Relations, Hon.Mr Jone Usamate, acknowledged and commended Fiji’s efforts in the various international forums advocating and rallying the Pacific’s voice for action towards climate change, oceans and sustainable development related issues. Hon.Takizawa informed of Japan’s support towards Fiji on these forums, as well as working closely with the Pacific Islands countries to ensure success in pursuing the outcomes of the 7th Pacific Leaders Meeting (PALM-7). 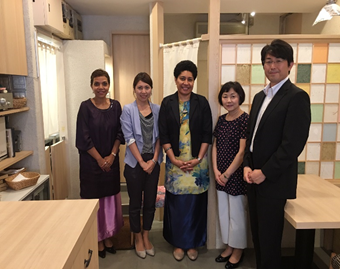 Mr.Takizawa also indicated the Japanese government’s willingness to continue its assistance in the areas of disaster risk reduction (DRR) and post-disaster rehabilitation particularly of schools in Fiji. He added that He added that Japan eagerly awaits the outcome of the Fijian Government consultation with the Asian Development Bank (ADB) in regard to Nadi River Flood Control Projects, and looks forward to further assisting Fiji in its infrastructure rehabilitation and development needs. The Parliamentary Vice Minister in acknowledging Fiji’s support towards Japan’s bid for the UN Security Council membership, also requested Fiji’s support in Japan efforts towards membership in the UN Commission on the Limits of the Continental Shelf (CLCS). Hon.Minister Usamate expressed the Fijian Government’s appreciation for Japan’s continued assistance in the areas of disaster response and rehabilitation, and Japan’s longstanding commitment towards Fijian education and its contributions, through scholarships, towards the upskilling Fiji’s pool of human resources. 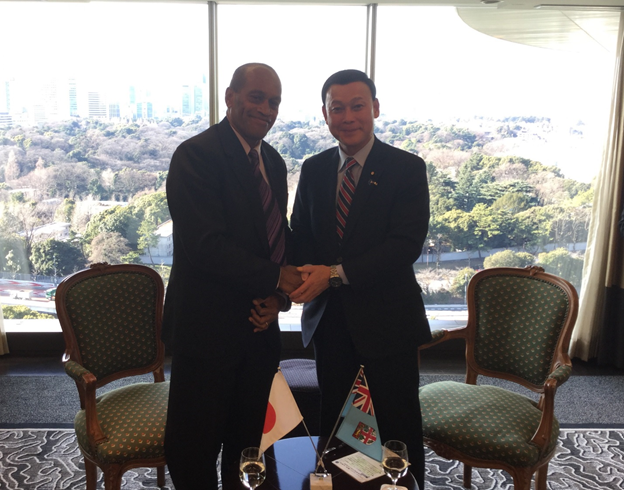 Minister Usamate informed that Fiji will continue to value its friendship with Japan, and looks forward to furthering this partnership. 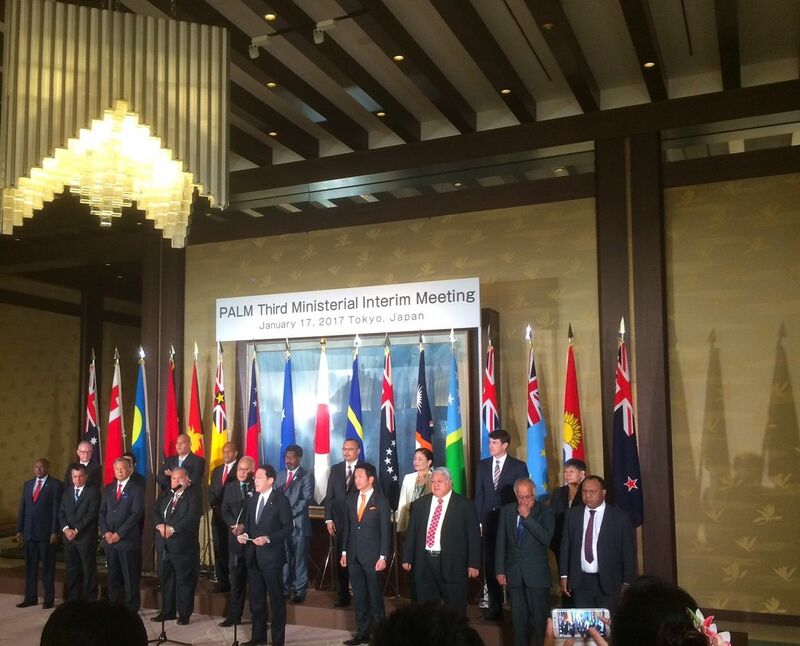 Hon.Minister Usamate is currently in Japan to attend the Third Ministerial Interm Meeting for PALM-7 on behalf of the Prime Minister and Minister for Foreign Affairs. He was accompanied by the Permanent Secretary for Foreign Affairs, Mr.Robin Nair, Fiji’s Ambassador to Japan, HE Isikeli Mataitoga, and Fiji Embassy officials Mr Isikeli Nadalo (First Secretary) and Ms.Kelera Savu (Second Secretary). Hon Jone Usumate represented Fiji on behalf of Prime Minister and Minister of Foreign Affairs at the Regional Ministerial Consultations with Japan in Tokyo. He was accompanied by Permanent Secretary of Foreign Affairs, Ambassador Robin Nair and Fiji Ambassador in Tokyo, Ambassador Isikeli Mataitoga. Fiji’s Minister for Employment, Productivity & Industrial Relations, Hon.Jone Usamate (left back) at the Press Conference. At the front are Japan’s Foreign Minister Hon.Kishida flanked by his co-chair, FSM Foreign Secretary Hon.Robert (left). The Third PALM Ministerial Interim Meeting between the Forum Island Countries (FIC) and Japan was held in Tokyo on 17 January 2017. The meeting which was held at the level of Ministers to review the progress and implementation of the decisions that were agreed to by the Leaders of Japan and FICs when they met in Iwaki City, Fukushima in May 2015. Most of the Forum Island Countries were represented at Ministerial level and some at level of Head of Government level. The meeting was Co-Chaired by Hon Fumio Kishida, Minister of Foreign Affairs of Japan and Hon. Lorin Robert, Secretary of Foreign Affairs of the Federated States of Micronesia from FIC side. The main issues discussed were the follow up in Japan/Forum Island Countries cooperation in the international fora, United Nations Reform and support for international conferences hosted by Pacific Island Countries. In the second session of the meeting the two main areas discussed covered working towards sustainable development and self-sufficient development through addressing environmental challenges brought about by climate change, Disaster Risk Reduction and waste management. Hon Fumio Kishida in his opening remarks to the meeting acknowledges the important role Fiji will be engaged in as Chair of COP 23 of the UNFCCC and, also as co-host of the Global Conference on Sustainable Use of Oceans and Seas in 2017. 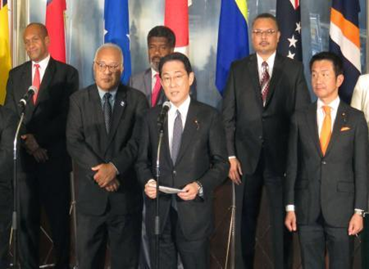 He observed that Japan will support Fiji in these roles. Hon Jone Usamate spoke on trade, investment and business development issues and the need to develop investment and business opportunities that create jobs for PICs. In terms of the issues that may be reflected on the agenda of the PALM 8 Meeting in 2018 he suggested that trade in services needs to discussed as an area of international trade that most PICs could be engaged in. The need to look at SMEs from Prefectural Government to engage with PICs counterparts, given their comparable economies of scale is to be encouraged through Japanese assistance. At the end of the 3rd Ministerial Interim Meeting, the Hon Fumio Kishida announced that the next date of the 8th PALM Leaders Meeting will be 17-18 May 2018 and to be hosted in Iwaki City, Fukushima. 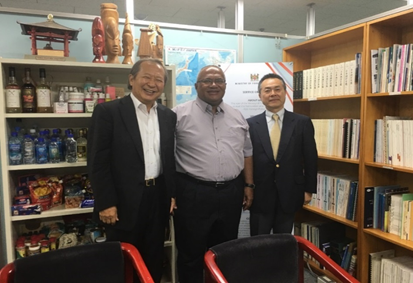 The Hon Mr. Jone Usamate MP, Minister of Employment, Productivity, and Industrial relations was the head of the Fijian Delegation with Ambassador Robin Nair, Permanent Secretary of Foreign Affairs, and Ambassador Isikeli Mataitoga, Ambassador of Republic of Fiji to Japan. Assisting the Fiji Delegations were Mr Isikeli Nadalo, First Secretary and Ms Kelera Savu Second Secretary.